Partner with the National Honor Societies. Target high-achieving high school and middle school students and student activity advisers. More than 1.6 million students participate in National Honor Society (NHS) and National Junior Honor Society (NJHS) activities each year. More than 25,000 chapters can be found in high schools and middle schools around the globe. Each chapter is managed by an adviser—a faculty member, counselor, or professional staff member responsible for overseeing member selection and chapter activities. LEAD (Leadership Experience and Development) Conferences are weekend events held three times annually in major U.S. locations. Past conferences have been held in Chicago, Phoenix, and Washington, D.C.—a sellout for the past two years. Attendance: Varies by location. Combined among all three conferences each year: approximately 2,000 students. These one-day events offer hands-on experiential leadership development and student empowerment. Your college or university can host! Host a State Summit and showcase your campus! For additional exposure, offer faculty or staff who can be part of our on-site workshop facilitator team. NHS and NJHS offer college admission planning webinars throughout the academic year. These online tutorial sessions guide high school students through critical steps in their college search and enrollment journey. Sessions include topics such as application preparation help, writing personal statements, etc. Guided practice as well as question-and-answer periods during each session open engagement opportunities between students and presenters. Sessions are recorded for repeat viewing by members. School of Thought is a blog of the National Association of Secondary School Principals, parent organization of the National Honor Societies. Its Student Voice microblog specifically targets educators and advisers with a focus on student development matters. This is an ideal opportunity to start a conversation that amplifies issues impacting student success. Author a 300- to 500-word blog post for School of Thought. The National Association of Secondary School Principals (NASSP), parent organization of NHS and NJHS, publishes and posts an annual guide online, accessible to principals, teachers, parents, and students. A national committee of education leaders vets programs included on the list using a standards-based rubric. The purpose of the list is to validate each program’s educational value, organizational structure, and financial integrity to inform school and individual decision making about participation. Published six times annually, Advise magazine targets advisers of NHS, NJHS, and National Student Council (NatStuCo). Each edition is posted online and accessible to affiliated schools. 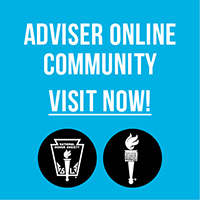 Twice each year, Advise includes “Participation Station,” a pullout section specifically targeting student members of NHS, NJHS, and National Student Council. Past pullouts have focused on college preparation tips as well as leadership and community service guidance. Targeting advisers: Write a 750-1,000 word article of interest to middle level and/or high school student program advisers. Present a “day in the life” of your college or university students by doing a “Social Media Takeover” of the NHS/NJHS Facebook, Twitter, and Instagram accounts for a day. Showcase your campus, residence halls, iconic facilities, students, and any activities during your “takeover day” that will help NHS and NJHS students envision themselves there! This monthly e-newsletter is sent to NHS and NJHS advisers with the latest Honor Society news, events, and tips. You can also rent a list of student activity advisers. To partner with NHS/NJHS through advertising and email marketing, contact Laura Gaenzle, the YGS Group, laura.gaenzle@theygsgroup.com, 717-430-2351.